Figure 2. 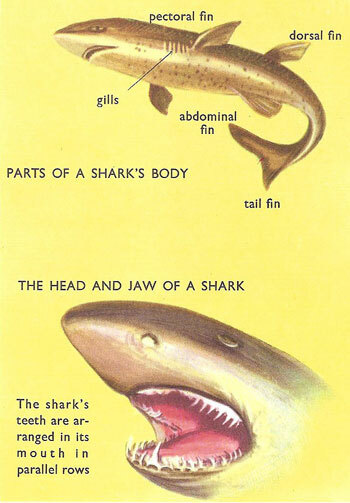 Types of shark. Sharks are members of the elasmobranch group of fish characterized by a cartilaginous skeleton and five to seven gill slits on the sides of the head. The skeleton of a shark is made not of bones but of cartilage which is less resistant; this, if boiled in water, becomes jelly-like. Many parts of the skeleton are very hard, however, as they are impregnated with lime salts. The skull is a cartilaginous box to which the jaw is attached by simple ligaments. The skin is very tough and, strange as it may seem, 'toothy', for each scale bears a hard, enamel-coated projection. The teeth (see Figure 1), unlike those of other animals, do not tell the shark's age, for sharks are provided with new teeth as soon as the old ones break off or fall out. They have 6 or 7 parallel rows of teeth, one behind the other, the row in use being in the front. When these teeth wear away and fall out the membrane just behind moves forward and inserts a brand new 'denture' in just the right place! The teeth are sharp but not very strong and are used not for tearing the prey to pieces but for holding it until it is swallowed whole. Sharks belong to the superorder Selachimorpha in the subclass Elasmobranchii in the class Chondrichthyes. The Elasmobranchii also include rays and skates. About 500 species of sharks are known split across eight orders. Eight varieties are shown in Figure 2. 1. The nurse shark, or gata, grows to 6 to 12 feet in length and is found in the tropical Atlantic near the coasts. 2. The blue shark is 25 feet or more long. It follows ships in the open sea and gobbles up rubbish thrown overboard and even enters harbors. The following things were once found in the stomach of one of these creatures; two heads of sheep, the hindquarters of a pig, an entire dog complete with chain and collar, an old shoe, 200 pounds of meat of unidentifiable origin, and half a dozen bottles. The blue shark can travel at a speed of 30 miles per hour. 3. The tiger shark can reach a length of 15 to 30 feet. It is found in warm seas and sometimes enters harbors and river mouths to attack fish, including other sharks, and dolphins. 4. The hammerhead is up to 15 feet long and is so named because of the shape of its head. It is viviparous, which means that it is born from an egg within the mother's body and issues from the mother already formed. 5. The great white shark is large, powerful, and aggressive. It is 40 feet or more long and weighs well over a ton. Its teeth can be as long as three inches. 6. The thresher shark is 15 to 20 feet long and weighs nearly half a ton. It has a slender body with a very long tail, which seems to be used for catching small fish. What happens is that it beats, or thrashes, the surrounding water with its tail so that the small fish group themselves together, seeking safety in numbers. Whereupon the Thresher opens its huge mouth and swallows them. It has been seen to flip the fish, one after another, into its mouth with its tail. 7. The whale shark is the largest of all fish. It can be as much as 60 feet long and weigh 7 tons. Its mouth is at the very end of the snout. It feeds on plankton. 8. The cub shark is about 5 feet long. It lives on muddy beds and feeds off mollusks, crustaceans and fish. 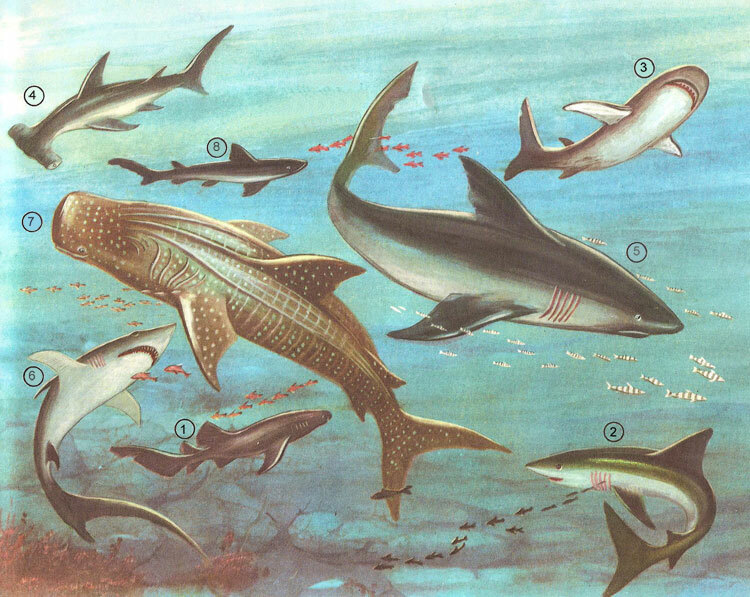 Small fish known as pilot fish (see Figure 3) accompany sharks, and it was once thought that they led them to their prey; in fact, however, they are there so as to feed off the scraps left over by the sharks in the course of their meals. Pilot fish are always to be found in the company of a solitary shark, or at most two sharks. The remora (see Figure 4), which can be 3 to 4 feet long, attaches itself to a shark's skin so as to be carried along. It it goes off to eat something it soon returns to its post. It attaches itself by means of a sucker on the top of its head.